Cuba, officially the Republic of Cuba, consists of the island of Cuba (the largest of the Greater Antilles), the Isle of Youth and several adjacent small islands. Cuba is located in the northern Caribbean at the confluence of the Caribbean Sea, the Gulf of Mexico and the Atlantic Ocean. Cuba is south of the eastern United States and the Bahamas, west of the Turks and Caicos Islands and Haiti and east of Mexico. The Cayman Islands and Jamaica are to the south. Cuba is the most populous country in the Caribbean. Its people, culture and customs draw from several sources including the aboriginal Taíno and Ciboney peoples, the period of Spanish colonialism, the introduction of African slaves, and its proximity to the United States. The island has a tropical climate that is moderated by the surrounding waters; however, the warm temperatures of the Caribbean Sea and the fact that Cuba itself almost completely blocks access to the Gulf of Mexico, make Cuba prone to frequent hurricanes. Cuba is perhaps the most well-known Caribbean nation due to its pivotal role in world politics in the twentieth century. A pawn during the Cold War between the Soviet Union and the United States, a nuclear world war nearly broke out during the Cuban Missile Crisis of 1962. At the beginning of the twenty-first century, the nation is attempting to dig out from decades under a communist and socialist system and is re-establishing relationships with free and advanced nations. Cuba is an archipelago of islands located in the Caribbean Sea. Cuba is the nation's principal island, which is surrounded by four main groups of islands. These are the Colorados, the Camagüey, the Jardines de la Reina and the Canarreos. 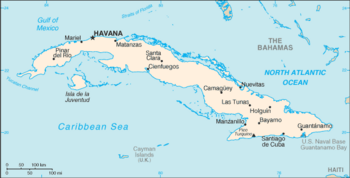 The main island of Cuba constitutes most of the nation's land area (105,006 km² or 40,543 square miles) and is the 17th-largest island in the world by land area. 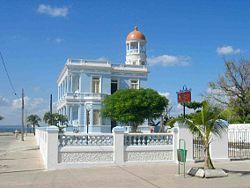 The second largest island in Cuba is the Isla de la Juventud (Isle of Youth) in the southwest, with an area of 1180 square miles (3056 km²). Cuba has a total land area of 42,803 square miles (110,860 km²), slightly smaller than the U.S. state of Pennsylvania. It has 3,735 km of coastline and 29 km of land borders—all with the leased United States territory at Guantánamo Bay, where the U.S. Navy's Guantanamo Bay Naval Base is located. The main island consists mostly of flat to rolling plains. At the southeastern end is the Sierra Maestra, a range of steep mountains whose highest point is the Pico Real del Turquino at 2,005 meters (6,578 ft). 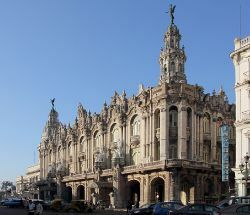 Havana is the largest city and capital; other major cities include Santiago de Cuba and Camagüey. Better known smaller towns include Baracoa which was the first Spanish settlement on Cuba, Trinidad, a UNESCO world heritage site, and Bayamo. Natural resources include cobalt, nickel, iron ore, copper, manganese, salt, timber, silica, and petroleum. At one time the whole island was covered with forest. There are still many cedar, rosewood, mahogany, and other valuable trees. Large areas were cleared in order to grow sugar cane, resulting in the need to import timber. The recorded history of Cuba began on October 28, 1492, when Christopher Columbus sighted the island during his first voyage of discovery and claimed it for Spain. The island had been inhabited by Amerindian peoples known as the Guanahatabey and Ciboney in the western section, with the Taíno peoples in the remaining area. The Taino, a sophisticated agricultural society, were related to the Arawakan peoples of South America who had migrated to the Greater Antilles. The coast of Cuba was fully mapped by Sebastián de Ocampo in 1511, the same year the first Spanish settlement was founded by Diego Velázquez de Cuéllar at Baracoa. Other towns, including Havana, soon followed. Cuba soon became a point of departure for exploration on the North American mainland. Hernándo Cortés' expedition utilized 400 Spaniards and 3000 Indians, depleting the population. By 1550 the native population had been decimated mainly by European-introduced disease and maltreatment. Aspects of the region's aboriginal heritage has survived, however, in part due to the rise of a significant Mestizo population. By 1570, most residents were of mixed ancestry, a mixture of Spanish, African, and Indian heritages. Intermarriage was common due to the absence of women emigrants as well as the military nature of the conquest. Cuba soon began to depend on the sugarcane industry as its main source of economy. To fulfill the demand for sugar, slave-based plantations sprang up. By the 1840s, nearly one-third of the island's population was slaves. More than 600,000 slaves were imported from Africa in the nineteenth century. Many of these arrived after 1820, the year that Spain and Great Britain had agreed would be the end of slave trading in the Spanish colonies. By 1830 the Cuban sugar industry had become the most mechanized in the world. Small farmers were expelled from their land while the forests were depleted. By 1850, 80 percent of the island's exports were sugar. Wealthy plantation owners gained prominence in the political and social fields. Contract workers, Mexican-Indian and Chinese, joined the labor force, taking on tasks as degrading and dangerous as the slaves faced. At the same time, the British navy attacked slave ships, and the Americans abolished slavery. The African slave trade ended in 1865, though it took another 21 years before slavery was abolished in Cuba. During this time the island was plagued by recurring waves of disease: cholera, malaria, and influenza. 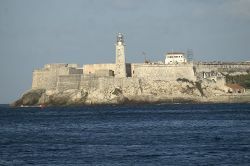 Castillo de los Tres Reyes del Morro (Morro Castle (fortress), built in 1589 to guard the eastern entrance to Havana Bay). Cuba was a Spanish possession for 388 years, ruled by a governor in Havana, with an economy based on plantation agriculture and the export of sugar, coffee and tobacco to Europe and later to North America. The Spanish population was boosted by settlers leaving Haiti when that territory was ceded to France in 1697. An English fleet under command of Lord Albermarle took control of the island in the Battle of Havana in 1762, part of the Seven Years' War, but rule was restored to Spain the following year. In the 1820s, when the other parts of Spain’s empire in Latin America rebelled and formed independent states, Cuba remained loyal, although there was some agitation for independence. This was partly because the prosperity of the Cuban settlers depended on their export trade to Europe, partly through fears of a slave rebellion (as had happened in Haiti) if the Spanish withdrew and partly because the Cubans feared the rising power of the United States. An additional factor was the continuous migration of Spaniards to Cuba from all social strata, a demographic trend that had ceased in other Spanish possessions decades before and which contributed to the slow development of a Cuban national identity. Cuba’s proximity to the U.S. has been a powerful influence on its history. Throughout the nineteenth century, Southern politicians in the U.S. plotted the island’s annexation. During the summer of 1848, President James Polk quietly authorized his ambassador to Spain, Romulus Mitchell Saunders, to negotiate the purchase of Cuba, offering up to $100 million, an astonishing sum of money at the time for one territory. Spain, however, refused to consider ceding one of its last possessions in the Americas. Agitation for Cuban independence from Spain revived in the latter half of the nineteenth century, leading to a rebellion in 1868 led by Carlos Manuel de Céspedes, now known as the "father of the revolution," a wealthy planter from Oriente province who freed his slaves, proclaimed a war and was named President of the Cuban Republic-in-arms. This resulted in a prolonged conflict known as the Ten Years' War between pro-independence forces and the Spanish Army, allied with local supporters. At the Convention of Zanjon in 1878, Spain promised to reform the island's political and economic system. This brought an end to the conflict. Pro-independence agitation temporarily died down, but the nationalist leader Antonio Maceo and several others refused to accept the Spanish conditions. In 1879 Calixto Garcia began another uprising, (known as "la guerra chiquita" - the little war) but received little support. Spanish forces put down the uprising the following year. Partly in response to U.S. pressure, slavery was abolished in 1886, although the African-descended minority remained socially and economically oppressed, despite formal civic equality granted in 1893. During this period, the rural poverty in Spain provoked by the Spanish Revolution of 1868 and its aftermath led to an even greater Spanish emigration to Cuba. During the 1890s, pro-independence agitation revived, fueled by resentment of the restrictions imposed on Cuban trade by Spain and hostility to Spain’s increasingly oppressive and incompetent administration of Cuba. Few of the promises for economic reform made by the Spanish government in the Pact of Zanjon were kept. Annual trade between Cuba and the United States had reached about $100 million, but in 1894 Spain canceled a Cuban-U.S. trade pact. Taxes were increased and more trade restrictions were imposed. War broke out in February 1895. The writer and poet José Martí who had organized the war over a ten-year period while in exile in the U.S. and proclaimed Cuba an independent republic, together with revolutionary leader Máximo Gómez landed with an invasion force. Martí was killed at Dos Rios shortly after landing in Cuba. 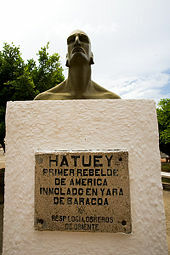 His death immortalized him, making him Cuba’s undisputed national hero. The eastern region of the island was quickly conquered and the conflict spread westward. In September 1895 the Republic of Cuba was declared. In 1896 Spain placed 200,000 troops on the island who ushered rural residents into urban camps. Ultimately tens of thousands died of starvation and disease. Estates and whole towns were burned (by both sides). The rebels concentrated on destroying the sugarcane crop. In 1897 Spain moved to a more conciliatory policy, promising home rule with an elected legislature. The following year they ended their relocation program. By this time however, most of the population had begun to sympathize with the rebels and the war for independence continued. Commercial activity had essentially ceased and news of Spanish atrocities on the island reached the U.S. Anti-Spanish resentment began to heat up. Shortly afterward, on February 15, 1898, the U.S. battleship Maine was mysteriously blown up in Havana harbor, killing 266 men. Forces in the U.S. favoring intervention in Cuba seized on this incident to accuse Spain of blowing up the ship, although there was no evidence of who had done the deed. The U.S. Congress passed a resolution calling for intervention and President William McKinley was quick to comply. The result was the Spanish-American War, in which U.S. forces landed in Cuba in June 1898 and quickly overcame the exhausted Spanish resistance. In August a peace treaty was signed under which Spain agreed to withdraw from Cuba. Some advocates in the U.S. supported Cuban independence, while others argued for outright annexation. As a compromise, the McKinley administration placed Cuba under a 20-year U.S. treaty. The Cuban independence movement bitterly opposed this arrangement, but unlike the Philippines, where events had followed a similar course, there was no outbreak of armed resistance. Theodore Roosevelt, who had fought in the Spanish-American War and had some sympathies with the independence movement, succeeded McKinley as President of the United States in 1901 and abandoned the 20-year treaty proposal. Instead, the Republic of Cuba gained formal independence on May 20, 1902, with the independence leader Tomás Estrada Palma becoming the country’s first president. Under the new Cuban constitution, however, the U.S. retained the right to intervene in Cuban affairs and to supervise its finances and foreign relations. Under the Platt Amendment, Cuba also agreed to lease to the U.S. the naval base at Guantánamo Bay. Cuba today does not celebrate May 20 as their date of independence, but instead October 10, as the first declaration of independence. The day Fidel Castro and his army entered Havana, January 1, 1959, is celebrated as "the triumph of the revolution." Independent Cuba soon ran into difficulties as a result of factional disputes and corruption among the small educated elite and the failure of the government to deal with the deep social problems left behind by the Spanish. In 1906, following disputed elections to choose Estrada Palma’s successor, an armed revolt broke out and the U.S. exercised its right of intervention. The country was placed under U.S. occupation and a U.S. governor, Charles Edward Magoon, took charge for three years. Magoon's governorship in Cuba was viewed in a negative light by many Cuban historians for years thereafter, believing that much political corruption was introduced during Magoon's years there. In 1908 self-government was restored when José Miguel Gómez was elected President. The Gomez administration, which lasted until 1913, set a pattern of graft, corruption, maladministration, fiscal irresponsibility, and social insensitivity—especially toward Afro-Cubans. Led by Evaristo Estenoz and Pedro Ivonet the African-Cuban community was organized to secure better jobs and more political patronage. Corruption continued with the subsequent administrations of Mario García Menocal (1913–1921), Alfredo Zayas (1921–1925), Gerardo Machado y Morales (1925–1933), Fulgencio Batista (through puppets 1934–1939 and himself 1940–1944 and 1952–1959), Ramón Grau San Martín (1944–1948), and Carlos Prío Socarrás (1948–1952). Machado's administration was fraught with troop intimidation and assassination. He was overthrown by leftist groups, with U.S. help, in the Revolution of 1933, which brought Batista to power. Batista's administration proved to be no different from Machado's. During his rule, however, Cubans gained greater control over their own economy and major national development projects were undertaken. His hold on power was weakened by the Great Depression, which drove down the price of Cuba’s agricultural exports and caused widespread poverty. In August 1933, elements of the Cuban army staged a coup which deposed Machado and installed Carlos Manuel de Céspedes, son of Cuba's founding father, as President. In September, however, a second coup led by Sergeant Fulgencio Batista overthrew Céspedes leading to the formation of the first Ramón Grau San Martín government. This government lasted just 100 days, but engineered radical liberal changes in Cuban society and a rejection of the Platt amendment. In 1934, Batista and the army, who were the real center of power in Cuba, replaced Grau with Carlos Mendieta y Montefur. In 1940, Batista decided to run for President himself. The leader of the constitutional liberals Ramón Grau San Martín refused to support him, forcing him to turn instead to the Communist Party of Cuba, which had grown in size and influence during the 1930s. With the support of the communist-controlled labor unions, Batista was elected President and his administration carried out major social reforms and introduced a new progressive constitution. Several members of the Communist Party held office under his administration. Batista's administration formally took Cuba into World War II as a U.S. ally, declaring war on Japan on December 9, 1941, then on Germany and Italy on December 11, 1941; Cuba, however, did not significantly participate militarily in World War II hostilities. At the end of his term in 1944, in accordance with the constitution, Batista stepped down and Ramón Grau was elected to succeed him. Grau initiated increased government spending on health, education and housing. Grau’s liberals were bitter enemies of the Communists and Batista opposed most of Grau’s program. In 1948, Grau was succeeded by Carlos Prío Socarrás, who had been Grau's minister of labor and was particularly disliked by the Communists. Prío was a less principled liberal than Grau and, under his administration, corruption increased notably. This was partly a result of the postwar revival of U.S. wealth and the consequent influx of gambling money into Havana, which became a safe haven for mafia operations. Nevertheless Prío carried out major reforms such as founding a National Bank and stabilizing the Cuban currency. The influx of North American money fueled an economic boom which did much to raise living standards and create a prosperous middle class in most urban areas, although the gap between rich and poor became wider and more obvious. By the late 1950s, Cuba had developed one of the leading economies in Latin America. It had among the highest annual per capita incomes in the region, $353. However, the majority of rural workers earned only about one-fourth this amount and lived in poverty. The thriving economy benefited only a small portion of the population. Much of the country suffered a lack of public services, as well as unemployment and underemployment. A number of foreign investors controlled the economy, owning a great percentage of the arable land, essential services and still–profitable sugar production. Throughout this decade, Batista exercised absolute control over the political system. When it became apparent that Batista had little chance of winning the 1952 election, he staged a coup (March 10, 1952) and held power with the backing of a nationalist section of the army as a “provisional president” for the next two years. In 1954, under pressure from the U.S., he agreed to elections. The Partido Auténtico put forward ex-President Grau as their candidate, but he withdrew amid allegations that Batista was rigging the elections in advance. Batista could then claim to be an elected President. His regime was marked by severe corruption and poverty. The internal decay of Batista's government and resultant suffering of the population and their frustrations gave power to the opposition that brought about to his downfall, led by Fidel Castro. Castro had been a legislative candidate for elections in 1952 that were aborted by Batista. As the nation grew increasingly discontent, Castro formed an underground organization of supporters, including his brother, Raúl, and Mario Chanes de Armas. Together they actively plotted to overthrow Batista, collecting guns and ammunition and finalizing their plans for an armed attack on Moncada Barracks, Batista's largest garrison outside Santiago de Cuba. On July 26, 1953, they attacked. The attack proved disastrous and more than 60 of the 135 militants involved were killed. Castro and other surviving members of his group managed to escape to an area of the rugged Sierra Maestra mountains east of Santiago where they were eventually discovered and captured. Castro was tried in the fall of 1953 and sentenced to up to 15 years in prison. After having served less than two years, he was released in May 1955 due to a general amnesty from Batista who was under political pressure. He and a group of friends went to Mexico to prepare for the overthrow of the Cuban government. In Mexico, Castro met Argentine–born Ernesto "Che" Guevara, a proponent of guerrilla warfare. Guevara joined the group of rebels and became an important force in shaping Castro's evolving political beliefs. Guevara's observations of the misery of the poor in Latin America had already convinced him that the only solution lay in violent revolution. On November 26, 1956, Castro and his band of 81 rebels, mostly Cuban exiles, set out from Tuxpan, Mexico aboard the yacht Granma for Cuba. Landing at Playa Las Coloradas near the eastern city of Manzanillo on December 2, they were routed and nearly annihilated by security forces. A dozen survivors, including Castro, his brother Raul and Guevara retreated to the Sierra Maestra and began a guerrilla campaign. Through 1957 and 1958, opposition to Batista grew, especially among the upper and middle classes and the students, among the hierarchy of the Catholic Church and in many rural areas. In response to Batista's plea to purchase better arms from the U.S. in order to root out the insurgents in the mountains, the United States government imposed an arms embargo on the Cuban government on March 14, 1958. By late 1958, the rebels had succeeded in breaking out of the Sierra Maestra and launched a general insurrection, joined by hundreds of students and others fleeing Batista’s crackdown on dissent in the cities. In 1957 a U.S. journalist writing for the New York Times made his way through military lines and met with the Castro in the Sierra Maestra. He reported that the romantic revolutionary was no Communist; in fact, the local Communists opposed him. The New York Times front page stories by Herbert Matthews presented Castro as a romantic and appealing revolutionary, bearded and dressed in rumpled fatigues. Castro's image was changed from that of a hothead into the youthful face of Cuba's future. Through television, Castro's rudimentary command of the English language and charismatic presence enabled him to appeal directly to a U.S. audience. Batista's government was isolated in 1958 when the U.S. imposed an arms embargo. At the same time several Cuban military commanders sympathized with the rebellion or joined it. When the rebels captured Santa Clara, east of Havana, Batista decided the struggle was futile and fled the country to exile in Portugal and later Spain. Castro’s rebel forces entered the capital on January 1, 1959. Fidel Castro became Prime Minister of Cuba in February 1959, and held effective power in the country until formally handing it over to his brother, Raul Castro, in 2008. During 1959, Castro’s government carried out measures such as the confiscation of private real estate, the nationalization of public utilities, and began a campaign to institute tighter controls on the private sector such as the closing down of the gambling industry. Castro also evicted many Americans, including mobsters, from the island. These measures were undertaken by his government in the name of the program that he had outlined in the ''Manifiesto de Montecristi'' while in the Sierra Maestra. He failed to enact the most important elements of his reform program, however, which was to call elections under the Electoral Code of 1943 within the first 18 months of his time in power and to restore all of the provisions of the Constitution of 1940 that had been suspended under Batista. Castro flew to Washington, DC in April 1959, but was not received by President Eisenhower, who decided to attend a golf tournament rather than meet with him. Castro returned to Cuba after a series of meetings with African-American leaders in New York's Harlem district, and after a lecture on "Cuba and the United States" delivered at the headquarters of the Council on Foreign Relations in New York. Summary executions of suspected Batista collaborators, coupled with the seizure of Cuban-owned businesses and the rapid demise of the independent press, nominally attributed to the powerful pro-revolution printing unions, raised questions about the nature of the new government. Attitudes towards the Cuban revolution both in Cuba and in the United States were changing rapidly. The nationalization of U.S.-owned companies (to an estimated 1959 value of US$1 billion) aroused immediate hostility within the Eisenhower administration. Cubans began to leave their country in great numbers and formed a burgeoning expatriate community in Miami. Many were angry at Castro's revolutionary government due to its seizure of private property in Cuba and the increasing number of "paredones," the summary executions of those who opposed his government. Cuban-Americans soon formed a powerful political lobbying group in the United States. The U.S. government became increasingly hostile towards Cuba throughout 1959. This, in turn, may have influenced Castro's movement away from the liberal elements of his revolutionary movement and increased the power of hardline Marxist figures in the government, notably Che Guevara, although this theory is open to debate. In October 1959, Castro openly declared himself to be friendly towards Communism, though he did not yet claim to be a Communist himself, while the liberal and other anti-Communist elements of the government were purged. Within six months of coming to power, he had sent agents to initiate revolutions in several Latin American countries, and established diplomatic and economic ties with leading socialist powers. Many Cuban citizens who had initially supported the revolution fled the country to join the growing exile community in Miami. In March 1960, the first aid agreements were signed with the Soviet Union. In the context of the Cold War, the U.S. saw the establishment of a Soviet base of influence in the Americas as a threat; and under the new Democratic administration of John F. Kennedy, plans were approved to remove Castro from power (known as "Operation Mongoose" or, "The Cuban Project"). In late 1960, a trade embargo was imposed, which strengthened Castro's ties with the Soviet Union, who stepped in to buy tons of Cuban sugar. At the same time, the Kennedy administration authorized plans for an invasion of Cuba by Florida-based Cuban exiles, taking advantage of anti-Castro uprisings which were repressed. The failed invasion in April 1961 came to be known as the Bay of Pigs Invasion. In October 1962 a major confrontation occurred between the United States and Cuba which marked the closest point which the world had come to engaging in a nuclear war. The U.S. learned in July 1962 that the Soviet Union had begun missile shipments to Cuba. These were medium- and intermediate-range ballistic missiles that had the capability of reaching the eastern United States within a few minutes following launch from Cuba. By the end of the following month, U.S. spy planes detected the presence of new military construction on the island. By mid-October a ballistic missile on a launching site was identified. The U.S. responded by placing a naval blockade on Cuba in order to prevent the receipt of further Soviet missile shipments. President Kennedy warned that U.S. forces would seize all weapons and materials the Soviets attempted to deliver. For the next several days Soviet ships which had already been en route to Cuba altered course away from the blockade zone. Messages between the leaders of the two superpowers were exchanged. On October 28, Soviet premier Nikita Khrushchev informed Kennedy that work on the missile sites would cease and missiles already in Cuba would be returned to the Soviet Union. Kennedy, in turn, committed that the U.S. would not invade Cuba, a fear founded on the failed Bay of Pigs Invasion. It was also learned that Kennedy quietly promised the withdrawal of nuclear-armed missiles from Turkey which the U.S. had deployed in previous years. The crisis was over by late November. Castro was infuriated by the Soviets' withdrawal in the face of the U.S. ultimatum but Cuba alone did not have the power to act against either superpower. Nine months after the assassination of John F. Kennedy, Nikita Khrushchev fell from power in October 1964. It is believed by political experts that this was due in large part to the humiliation suffered by the USSR during the Cuban Missile Crisis. A so-called 'Yank tank', one of the many remaining U.S. cars in Cuba, imported prior to the United States embargo against Cuba. During 1963, relations deteriorated again as Castro moved Cuba towards a fully-fledged Communist system modeled on the Soviet Union. The U.S. imposed a complete diplomatic and commercial embargo on Cuba. At this time U.S. influence in Latin America was strong enough to make the embargo very effective; Cuba was forced to direct virtually all its trade to the Soviet Union and its allies. The nation was plagued by shortages of foods, fuel, and other necessities. In 1965, Castro merged his revolutionary organizations with the Communist Party, of which he became First Secretary, with Blas Roca as Second Secretary; later to be succeeded by Raúl Castro, who as Defense Minister and Fidel’s closest confidant became the second most powerful figure in the government. Raúl Castro’s position was strengthened by the departure of Che Guevara to launch unsuccessful attempts at insurrectionist movements in Congo, and then Bolivia, where he was killed in 1967. Osvaldo Dorticós Torrado, President of Cuba from 1959 to 1976, was a figurehead of little importance. Castro introduced a new constitution in 1976 under which he became President himself, while remaining chairman of the Council of Ministers. During the 1970s, Castro moved onto the world stage as a leading spokesperson for Third World "anti-imperialist" governments. On a more concrete level, he provided invaluable military assistance to pro-Soviet forces in Angola, Ethiopia, Yemen and other African and Middle Eastern trouble spots. Cuban forces were decisive in helping the MPLA forces win the Angolan Civil War in 1975. Although the bills for these expeditionary forces were paid by the Soviets, they placed a considerable strain on Cuba’s economy and manpower resources. Cuba was also hampered by its continuing dependency on sugar exports. The Soviets were forced to provide further economic assistance by buying the entire Cuban sugar crop, even though they grew enough sugar beet to meet their own needs. In exchange, the Soviets supplied Cuba with all its fuel, since it could not import oil from any other source. Cuba’s economic dependence on the Soviet Union was deepened by Castro’s determination to build his vision of a socialist society in Cuba. This entailed the provision of free health care and education for the entire population. Through the 1970s and 1980s, the Soviets were prepared to subsidize all this in exchange for the strategic asset of an ally under the nose of the United States and the undoubted propaganda value of Castro’s considerable prestige in the developing world. By the 1970s, the ability of the U.S. to keep Cuba isolated was declining. Cuba had been expelled from the Organization of American States in 1962 and the OAS had cooperated with the U.S. trade boycott for the next decade, but in 1975, the OAS lifted all sanctions against the island-nation and both Mexico and Canada defied the U.S. by developing closer relations with Cuba. Both countries had hoped to foster liberalization in Cuba by allowing trade, cultural and diplomatic contacts to resume—in this they were disappointed, since there was no appreciable easing of repression against domestic opposition. Castro did stop openly supporting insurrectionist movements against Latin American governments, although pro-Castro groups continued to fight the military dictatorships which then controlled most Latin American countries. The Cuban community in the U.S. grew in size, wealth and power and politicized elements effectively opposed liberalization of U.S. policy towards Cuba. However, the efforts of the exiles to foment an anti-Castro movement inside Cuba, let alone a revolution there, met limited success. The storming of the Peruvian embassy in Havana in April 1980 by 7000 Cuban citizens seeking political asylum and the resultant permission granted for them to leave the nation, led to the "Mariel boatlift" to the U.S. later that month. In all, over 125,000 Cubans—some of them criminals released from prisons—emigrated to the United States before the flow of vessels ended on June 15. The two countries signed an agreement in 1987 allowing 20,000 Cubans to emigrate annually to the United States. Tens of thousands have arrived illegally to the United States and elsewhere since the days of the revolution, with an uncounted number who died at sea. The demise of the Soviet Union in 1991 dealt Cuba a giant economic blow. It led to another unregulated exodus of asylum seekers to the United States in 1994, but was eventually slowed to a trickle of a few thousand a year by the U.S.-Cuban accords. Castro’s popularity was severely tested by the aftermath of the Soviet collapse, which led to a cut off in aid, the loss of a guaranteed export market for Cuban sugar and the loss of a source of cheap imported oil. It also caused, as in all Communist countries, a crisis in confidence for those who believed that the Soviet Union was successfully "building socialism" and providing a model that other countries should follow. In Cuba, however, these events were not sufficient to persuade Cuban Communists that they should voluntarily give up power. However, they did recognize that to survive they needed to open up to capitalism. In 1993 Cuba began to legalize small family-owned businesses, such as restaurants and encouraged private employment. Independent farms and farmers markets bloomed the following year. Foreign capitalists were invited to the island, including Canadian and Spanish hoteliers. In 1996, Cuba shot down two small aircraft piloted by a Florida-based anti-Castro group. This led to the passing of the Helms-Burton law, which threatened U.S. sanctions against foreign-owned companies investing in Cuba. In 1997, Christmas was restored as a national holiday, as the nation anticipated a visit by Pope John Paul II the following year. There was an influx of tourists, vastly improving the economy. During this time many Cubans began to question the future of socialism. By the late 1990s Cuba had more or less normal economic relations with most Latin American countries and had improved relations with the European Union, which began providing aid and loans to the island. China also emerged as a new source of aid and support, even though Cuba had sided with the Soviets during the Sino-Soviet split of the 1960s. Cuba also found new allies in President Hugo Chávez of Venezuela and President Evo Morales of Bolivia, major oil and gas exporters. Castro again drew international criticism when, in 1999, prominent dissidents were jailed and repressive laws were enacted. Castro maintained a firm grip on power, however, speculation grew on the state of his health, and rumors abounded. On July 31, 2006, Fidel Castro delegated his duties as President of the Council of State, President of the Council of Ministers, First Secretary of the Cuban Communist Party, and the post of commander in chief of the armed forces to his brother and First Vice President, Raúl Castro. This transfer of duties was initially described as temporary while Castro recovered from surgery undergone after suffering from an "acute intestinal crisis with sustained bleeding." He was too ill to attend the nationwide commemoration of the 50th anniversary of the Granma boat landing on December 2, 2006, which fueled speculation that Castro had stomach cancer. On February 19, 2008, Fidel Castro announced that he was resigning as President of Cuba. Five days later, Raúl Castro was elected as the new President of Cuba. In his acceptance speech, Raúl Castro promised that some of the restrictions that limit Cubans' daily lives would be removed. Following the enactment of the Socialist Constitution of 1976, which was adopted without following the procedures laid out in the Constitution of 1940, the Republic of Cuba was defined as a socialist state. This constitution was replaced by the Socialist Constitution of 1992, the present constitution, which claimed to be guided by the ideas of José Martí, and the political ideas of Karl Marx, Engels and Lenin. The present constitution also ascribes the role of the Communist Party of Cuba (PCC) to be the "leading force of society and of the state." The first secretary of the Communist Party is concurrently President of the Council of State (President of Cuba) and President of the Council of Ministers (sometimes referred to as Prime Minister of Cuba). Members of both councils are elected by the National Assembly of People’s Power. The President of Cuba, who is also elected by the Assembly, serves for a five-year term and there is no limit to the number of terms of office. 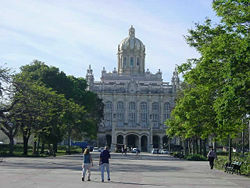 The Supreme Court of Cuba serves as the nation's highest judicial branch of government. It is also the court of last resort for all appeals from convictions in provincial courts. Cuba's national legislature, the National Assembly of People's Power (Asamblea Nacional de Poder Popular), is the supreme organ of State power and has 609 members who serve five-year terms. The assembly meets twice a year, between sessions legislative power is held by the 31 member Council of Ministers. Candidates for the Assembly are approved by public referendum. All Cuban citizens over 16 years of age who have not been found guilty of a criminal offense can vote. Article 131 of the Constitution states that voting shall be "through free, equal and secret vote." Article 136 states: "In order for deputies or delegates to be considered elected they must get more than half the number of valid votes cast in the electoral districts." Votes are cast by secret ballot and are counted in public view. Individual vote totals, which are invariably high, are not verified by non-partisan, independent, or non-state organs and observers. Nominees are chosen at local gatherings from multiple candidates before gaining approval from election committees. In the subsequent election, there is just one candidate for each seat, who must gain a majority to be elected. No political party is permitted to nominate candidates or campaign on the island, though the Communist Party of Cuba has held five party congress meetings since 1975. In 1997, the party claimed 780,000 members, and representatives generally constitute at least half of the Councils of state and the National Assembly. The remaining positions are filled by candidates nominally without party affiliation. Other political parties campaign and raise finances internationally, while activity within Cuba by opposition groups is minimal and illegal. Though the Cuban constitution has language pertaining to freedom of speech, rights are limited by Article 62, which states that "None of the freedoms which are recognized for citizens can be exercised contrary to the existence and objectives of the socialist state, or contrary to the decision of the Cuban people to build socialism and communism. Violations of this principle can be punished by law." Almost all adult Cubans participate in the community-based Committees for the Defense of the Revolution, which play a central role in daily life. These groups are designed to coordinate public projects, protect and ensure socialist ideology among the citizenry, and act as a neighborhood watchdog against "counter-revolutionary" activity. Since Cuba became a declared socialist republic in 1961, the United States Government has initiated various policy measures against Cuba which have had a considerable political and economic effect on the island; these have variously been designed to remove the leadership and to encourage Cuba to undertake political change towards a multi-party electoral process. The most significant of these measures is the United States embargo against Cuba and the subsequent Helms-Burton Act of 1996. The Cuban government, its supporters and other observers within and outside Cuba argue that Cuba has a form of democracy, citing the extensive participation in the nomination process at the national and municipal level. The Cuban government has been accused of numerous human rights abuses, including torture, arbitrary imprisonment, unfair trials, extra-judicial executions. Dissidents complain of harassment and torture. While the Cuban government placed a moratorium on capital punishment in 2001, it made an exception for perpetrators of an armed hijacking two years later. Groups such as Amnesty International and Human Rights Watch have issued reports on Cuban prisoners of conscience. Opponents claim the Cuban government represses free expression by limiting access to the Internet. The Cuban government denies the International Committee of the Red Cross access to its prisons and many human rights groups including Amnesty International are denied entry to Cuba. There are trade unions in Cuba, with a membership totaling 98 percent of the island's workforce. Unions do not register with any state agency, and are self-financed from monthly membership dues. Their supporters claim that union officers are elected on an open basis, and differing political views are found within each of the unions. However, all unions are part of an organization called the Confederación de Trabajadores Cubanos (Confederation of Cuban Workers, CTC), which does maintain close ties with the state and the Communist Party. Supporters claim that the CTC allows workers to have their voice heard in government; opponents claim that the government uses it to control the trade unions and appoint their leaders. The freedom of workers to express independent opinions is also a subject of debate. Supporters of the system argue that workers' opinions have in fact shaped government policy on several occasions, as in a 1993 proposal for tax reform, while opponents, citing studies by international labor organizations, point out that workers are required to pledge allegiance to the ideals of the Communist Party, and argue that the government systematically harasses and detains labor activists, while prohibiting the creation of independent (non-CTC affiliated) trade unions, that the leaders of attempted independent unions have been imprisoned, and that the right to strike is not recognized in the law. The provinces are further divided into 169 municipalities. Under Fidel Castro, Cuba became a highly militarized society. From 1975 until the late 1980s, massive Soviet military assistance enabled Cuba to upgrade its military capabilities. Since the loss of Soviet subsidies, Cuba has dramatically scaled down the numbers of military personnel, from 235,000 in 1994 to about 60,000 in 2003. The government now spends roughly 1.7 percent of GDP on military expenditures. The Cuban Government adheres to socialist principles in organizing its largely state-controlled planned economy. Most of the means of production are owned and run by the government and most of the labor force is employed by the state. Recent years have seen a trend towards more private sector employment. Capital investment is restricted and requires approval by the government. The Cuban government sets most prices and rations goods to citizens. After the 1959 Cuban Revolution, citizens were not required to pay a personal income tax (their salaries being regarded as net of any taxes). However, in 1996, the State started to impose income taxes on Cubans earning hard currency, primarily the self-employed. Like some other Communist and post-Communist states following the collapse of the Soviet Union, Cuba took limited free market-oriented measures to alleviate severe shortages of food, consumer goods, and services to make up for the ending of Soviet subsidies. These steps included allowing some self-employment in certain retail and light manufacturing sectors, the legalization of the use of the U.S. dollar in business, and the encouragement of tourism. 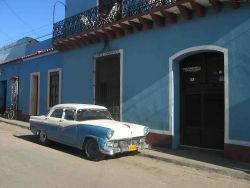 The rapid growth of tourism during the Special Period had widespread social and economic repercussions in Cuba. In 2001, studies showed that the average Cuban's standard of living was lower than before the downturn of the post-Soviet period. Paramount issues have been state salaries failing to meet personal needs under the state rationing system which is chronically plagued with shortages. As the variety and amount of rationed goods available declined, Cubans increasingly turned to the black market to obtain basic food, clothing, household, and health amenities. In addition, petty corruption in state industries, such as the pilferage of state assets to sell on the black market, is still common. In 2006 Cuba exported $2.956 billion, and imported $9.51 billion in goods. Its major export partners are the Netherlands, Canada and China; major import partners are Venezuela, Spain and the United States. Cuba's major exports are sugar, nickel, tobacco, fish, medical products, citrus, coffee and skilled labor. Imports include food, fuel, clothing, and machinery. Large reserves of oil were found in the North Cuba Basin sparking interest from other nations as well as calls from politicians in the U.S. to relax the Cuba trade embargo. The Cuban population is between 11 and 12 million, with a racial make-up that includes 64 percent White, 9 percent African, and 26 percent mixed race. DNA studies throughout the Antilles region have suggested that the contribution of indigenous neo-Taíno Nations to the local populations may be more significant than formerly believed. Asians make up about 1 percent of the population, and are largely of Chinese ancestry descended mostly from laborers who arrived in the nineteenth century to build railroads and work in mines. After the Industrial Revolution, many of these laborers stayed in Cuba because they could not afford return passage to China. The Cuban government controls the movement of people into Havana on the grounds that the Havana metropolitan area (home to nearly 20 percent of the country's population) is overstretched in terms of land use, water, electricity, transportation, and other elements of the urban infrastructure. Cuba also shelters a population of non-Cubans of unknown size. There is a population of several thousand North African teen and pre-teen refugees. 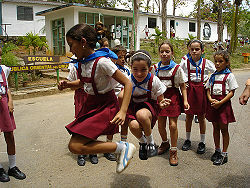 Cuba's birth rate is one of the lowest in the Western Hemisphere. Its overall population has increased continuously from around 7 million in 1961 to over 11 million now, but the rate of increase stopped in the last few decades, and has recently turned to a decrease, with the Cuban government in 2006 reporting the first drop in the population since the Mariel boatlift. Cuba, which has unrestricted access to legal abortion, has an abortion rate of 58.6 per 1,000 pregnancies in 1996 compared to a Caribbean average of 35, a Latin American average of 27, and a European average of 48. Additionally, contraceptive use is estimated at 79 percent. With its high abortion rate, low birth rate, and aging population, Cuba's demographic profile more resembles those of former Communist Eastern European countries such as Poland or Ukraine, rather than those of its Latin American and Caribbean neighbors. Immigration and emigration have had noticeable effects on the demographic profile of Cuba during the twentieth century. Between 1900 and 1930, close to a million Spaniards arrived from Spain. Since 1959, over a million Cubans have left the island, primarily to Miami, Florida, where a vocal, well-educated and economically successful exile community exists. The emigration that occurred immediately following the Cuban Revolution was primarily of the upper and middle classes that were predominantly white, thus contributing to a demographic shift along with changes in birth rates and racial identifications among the various ethnic groups. Seeking to normalize migration between the two countries - particularly after the chaos that accompanied the Mariel boatlift - Cuba and the United States in 1994 agreed (in what is commonly called the 1994 Clinton-Castro accords) to limit emigration to the United States. Under this, the United States grants a specific number of visas to those wishing to emigrate (20,000 per year since 1994) while those Cubans picked up at sea trying to emigrate without a visa are returned to Cuba. U.S. law gives the Attorney General the discretion to grant permanent residence to Cuban natives or citizens seeking adjustment of status if they have been present in the United States for at least one year after admission or parole and are admissible as immigrants; these escapes are often daring and most ingenious. Sport is Cuba's national passion. Due to historical associations with the United States, many Cubans participate in sports which share popularity in North America, rather than sports traditionally promoted in other Latin American nations. Baseball in Cuba is by far the most popular; other sports and pastimes include basketball, volleyball and track. Cuba is the dominant force in amateur boxing, consistently achieving high gold medal tallies in major international competitions. Cuban music is very rich and is the most commonly known expression of culture. The "central form" of this music is Son, which has been the basis of many other musical styles like salsa, rumba and mambo and a slower derivation of mambo, the cha-cha-cha. Rumba music originated in early Afro-Cuban culture. The Tres was also invented in Cuba, but other traditional Cuban instruments are of African and/or Taíno origin such as the maracas, güiro, marímba and various wooden drums including the mayohuacan. Popular Cuban music of all styles has been enjoyed and praised widely across the world. Cuban classical music, which includes music with strong African and European influences, and features symphonic works as well as music for soloists, has also received international acclaim thanks to composers like Ernesto Lecuona. Cuban literature began to find its voice in the early nineteenth century. 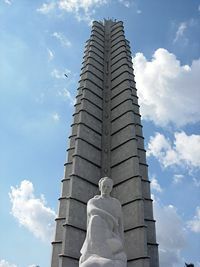 Dominant themes of independence and freedom were exemplified by José Martí, who led the Modernist movement in Cuban literature. Writers such as Nicolás Guillén and Jose Z. Tallet focused on literature as social protest. The poetry and novels of José Lezama Lima have also been influential. Writers such as Reinaldo Arenas, Guillermo Cabrera Infante, Leonardo Padura Fuentes, and Ronaldo Menedez have earned international recognition in the post-revolutionary era, though many writers have felt compelled to continue their work in exile due to perceived censorship by the Cuban authorities. Cuban cuisine is a fusion of Spanish and Caribbean cuisines. Cuban recipes share spices and techniques with Spanish cooking, with some Caribbean influence in spice and flavor. A traditional Cuban meal would not be served in courses; rather all food items would be served at the same time. The typical meal could consist of plantain, black beans and rice, ropa vieja (shredded beef), Cuban bread, pork with onions, and tropical fruits. Black beans and rice, referred to as moros y cristianos (or moros for short), and plantains are staples of the Cuban diet. Many of the meat dishes are cooked slowly with light sauces. Garlic, cumin, oregano and bay leaves are the dominant spices. Historically, Cuba has had some of the highest rates of education and literacy in Latin America, both before and after the revolution. All education is free of charge to Cuban citizens including university education. Private educational institutions are not permitted. School attendance is compulsory from ages six to the end of Basic secondary education (normally 15) and all students, regardless of age or gender, wear school uniforms with the color denoting grade level. Primary education lasts for six years, secondary education is divided into basic and pre-university education. Higher education is provided by universities, higher institutes, higher pedagogical institutes, and higher polytechnic institutes. The University of Havana was founded in 1728 and there are a number of other well established colleges and universities. The Cuban Ministry of Higher Education also operates a scheme of Distance Education which provides regular afternoon and evening courses in rural areas for agricultural workers. Education has a strong political and ideological emphasis, and students progressing to higher education are expected to have a commitment to the goals of the Cuban government. The Cuban government operates a national health system and assumes full fiscal and administrative responsibility for the health care of its citizens. Historically, Cuba has long ranked high in numbers of medical personnel and has made significant contributions to world health since the nineteenth century. Cuba has a multitude of faiths reflecting the island’s diverse cultural elements. Catholicism, brought to the island by Spanish colonialists at the beginning of the sixteenth century, is the most prevalent professed faith. However, after the revolution, Cuba became an officially atheistic state and severely restricted religious practice. Since 1991, restrictions have been eased. 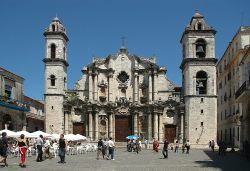 The Roman Catholic Church is made up of the Cuban Catholic Bishops' Conference (COCC), led by the Cardinal Archbishop of Havana. It has eleven dioceses, 56 orders of nuns and 24 orders of priests. In January 1998, Pope John Paul II paid a historic visit to the island, invited by the Cuban government and Catholic Church. The religious landscape of Cuba is also strongly marked by syncretisms of various kinds. This diversity derives from West and Central Africans who came to Cuba, and in effect reinvented their African religions. They did so by combining them with elements of the Catholic belief system, with a result very similar to Brazilian Umbanda. Catholicism is often practiced in tandem with Santería, a mixture of Catholicism and other, mainly African, faiths that include a number of cult religions. Cuba’s patron saint, La Virgen de la Caridad del Cobre (the Virgin of Cobre) is a syncretism with the Santería goddess Ochún. The important religious festival "La Virgen de la Caridad del Cobre" is celebrated by Cubans annually on September 8. Other religions practiced are Palo Monte, and Abakuá, which have large parts of their liturgy in African languages. Protestantism, introduced from the United States in the eighteenth century, has seen a steady increase in popularity. 300,000 Cubans belong to the island’s 54 Protestant denominations. Pentecostalism has grown rapidly in recent years, and the Assemblies of God alone claims a membership of over 100,000 people. The Episcopal Church of Cuba claims 10,000 adherents. 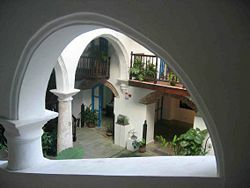 Cuba has small communities of Jews, Muslims and members of the Bahá'í faith. Havana has three active synagogues and no mosque. Most Jewish Cubans are descendants of Polish and Russian Jews who fled pogroms at the beginning of the twentieth century. There is, however, a sizable number of Sephardic Jews in Cuba, who trace their origin to Turkey (primarily Istanbul and Thrace). Most of these Sephardic Jews live in the provinces, although they do maintain a synagogue in Havana. In the 1960s, almost 8000 Jews left for Miami. In the 1990s, approximately 400 Jewish Cubans relocated to Israel in a co-ordinated exodus using visas provided by nations sympathetic to their desire to move to Israel. "… While we have no illusions about Raul Castro's political views, the Commission sees Fidel Castro's resignation as an opportunity for Cuban officials to reform their repressive practices. Cuba's future is best assured by fully protecting, in law and practice, the fundamental freedoms of religion, expression, association and other human rights. The Commission calls on the U.S. government and its allies to send this message clearly to Cuba's new leadership. The Cuban government abandoned its policy of atheism in the early 1990s; Castro welcomed a visit from Pope John Paul II in 1998, and two years later, religious holidays were reinstated. Those improvements did not last. A wave of arrests of democracy and free-speech advocates began in 2003, and the old tactics of restrictions and surveillance returned. The world saw once again a series of acts that demonstrated the authorities' attempts to impose inappropriate control over religious communities. A 2005 law on religion meant to "legalize" house churches has reinforced the government's efforts to increase control over some religious practice. Political prisoners and human rights and pro-democracy activists are increasingly subject to limitations on their right to practice their religion. Fidel Castro's nearly 50-year-long rule was marked by a stormy, and sometimes brutal, relationship with Cuba's religious communities, including arrests, deportations, and severe restrictions on religious activities. Religious life has been unjustly repressed and controlled by his government and generations of Cuban religious adherents have suffered," Cromartie said. "Today the Cuban government has the chance to fulfill its obligation to correct past wrongs and fully protect religious freedom." ↑ Cuban Peso Bills Central Bank of Cuba. Retrieved June 27, 2018. ↑ National symbols. Government of Cuba. Retrieved June 27, 2018. ↑ Central Intelligence Agency, Cuba The World Factbook. Retrieved June 27, 2018. ↑ Government type (most recent) by country, Nationmaster.com. Retrieved June 27, 2018. ↑ Cuba Population 2018 World Population Review. Retrieved June 27, 2018. ↑ 6.0 6.1 GDP - per capita (PPP) The World Factbook, Central Intelligence Agency. Retrieved June 27, 2018. ↑ GDP (current US$). Retrieved June 27, 2018. ↑ GDP per capita (current US$) Retrieved June 27, 2018. ↑ Anthony DePalma, Cuban Site Casts Light on an Extinct People, The New York Times, July 5, 1998. Retrieved June 27, 2018. ↑ J.A. Sierra, The Little War. Historyofcuba. Retrieved June 27, 2018. ↑ Hugh Thomas, Cuba, the Pursuit of Freedom (New York: Harper and Row, 1971, ISBN 0060142596). ↑ T. J. English, Havana Nocturne: How the Mob Owned Cuba and Then Lost It to the Revolution (New York: Wm. Morrow, 2008, ISBN 0061147710). ↑ Thomas E. Bogenschild, Dr. Castro's Princeton Visit, April 20-21, 1959. Retrieved June 27, 2018. ↑ Servando Gonzalez, Fidel Castro Supermole, Guaracabuya. Retrieved June 27, 2018. ↑ Constitution of the Republic of Cuba, 1992. Cubanet. Retrieved June 27, 2018. ↑ BBC News online, Country profile: Cuba. Retrieved June 27, 2018. ↑ Organization of American States, Inter-American commission on Human Rights. Retrieved June 27, 2018. ↑ Organization of American States - Comision Inteamericana de Derechos Humanos. Information on human rights in Cuba. Retrieved June 27, 2018. ↑ Cuba Verdad, Is Cuba a "Workers Paradise"? Retrieved June 27, 2018. ↑ Well-to-Do in Cuba to Pay an Income Tax New York Times, November 26, 1995. Retrieved June 27, 2018. ↑ Daniel Schweimler, Cuba's anti-corruption ministry BBC News, May 4, 2001. Retrieved June 27, 2018. ↑ 24.0 24.1 CIA, Cuba. The World Fact Book. Retrieved June 27, 2018. ↑ Laura Smith-Spark, Cuba oil prospects cloud US horizon BBC News, September 11, 2006. Retrieved June 27, 2018. ↑ Stanley K. Henshaw, Susheela Singh and Taylor Haas, 1999, The Incidence of Abortion Worldwide, The Alan Guttmacher Institute - International Family Planning Perspectives. Retrieved June 27, 2018. ↑ history.acusd.edu. Clinton Presidency 1993-2000. Retrieved June 27, 2018. ↑ Laninia Gasperini, The Cuban Education System: Lessons and Dilemmas. World Bank. Retrieved June 27, 2018. ↑ Sheikh Muhammad Al-Aboudy. Islam in Cuba, Islam Awareness. Retrieved June 27, 2018. ↑ Cuba: USCIRF Urges Full Protection of Freedom of Religion, Other Human Rights Washington, DC: United States Commission on International Religious Freedom, February 26, 2008. Retrieved June 27, 2018. Farber, Samuel. The Origins of the Cuban Revolution Reconsidered. University of North Carolina Press, 2006. ISBN 0807856738. Using declassified Soviet and US documents. This page was last modified on 27 June 2018, at 23:23.